Influencer marketing shines when the timing is right, and the message is on point. While it may feel new and unproven, influencer marketing is actually a hybrid of many tried-and-true marketing channels, including analyst and public relations, social media, word-of-mouth marketing, celebrity endorsements and the storytelling inherent in content marketing. As a topic, it’s a bit like a parrot noticing a shiny object. It’s both trending and distracting. Despite borrowing heavily from adjacent marketing practices and receiving more ink than Beyoncé, B2B influencer marketing know-how remains fuzzy for many. Looking to build your own influencer marketing strategy? Download PAN’s eBook ‘The Power of Voice: The Art & Science of Influencer Marketing’. Who is an influencer? Influencers are independent consultants. They are not analysts, media professionals, employee champions or client advocates. However, those folks have lots and lots of influence. This, understandably, leads to confusion. Are all influencers paid? Organic and paid influencers are motivated by different factors. One is neither inherently more or less important. Time and again, we’ve seen solid organic opportunities lead to well qualified paid programs. How quickly should we expect results? It is no faster or slower than collaborating with business media professionals. Results are dependent on the value you bring to the conversation. Relevance and timing impact outcome. Listen and follow influencers before, during and after you engage with them. Be responsive, thoughtful and take action on their behalf when interests align. Slow and steady, nurture the relationship. How should we measure results? For every influencer you work with, challenge yourself with the following thought: It would be incredibly valuable if they knew and could amplify [insert fact] about my brand. Then look for evidence their followers and their followers’ followers have heard the message. Influence, like good leadership, happens when others carry the message for you. Look to solutions like Audiense and Traackr to automate results tracking. Does size of an influencers community matter? Evaluate influencers on a standard set of criteria, including community size. Be sure to weight the criteria based on overall fit, like topical relevance, brand fit and whether or not those you value follow and engage with the influencer. Don’t overvalue size. It’s too easy to fake or buy followers. Does it scale? 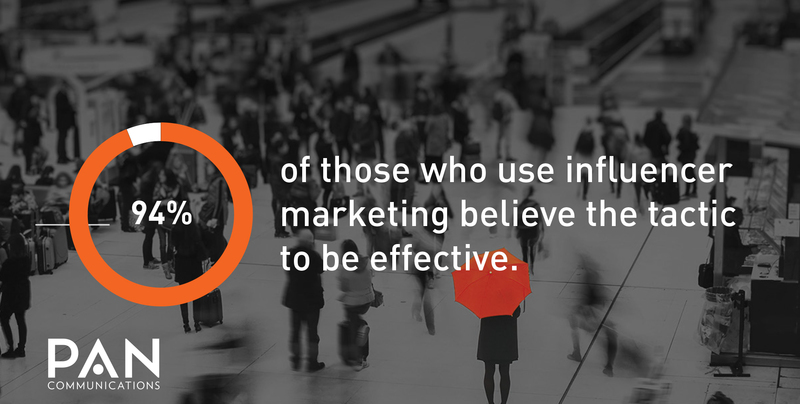 Influencer marketing is a person-to person program. For comparison, the time investment is akin to partner and client advisory board program management. Keep in mind your priorities may not be theirs; watch and manage for this risk. It gets easier with experience, but each influencer requires a custom approach. Does it work? Results don’t just happen. It’s a relationship. Hold up your end of the bargain and be willing to start small. Serendipity may prevail, but that’s luck, not a strategy. Work at it. What should I ask them to do? Define the deliverables and actions up front. Be specific: Don’t assume the small stuff, like mentions, retweets and likes, will just happen. Evaluate the ROI of each request, like a blog post, podcast interview, etc. Make sure the juice is worth the squeeze. What do influencers expect? It’s rare for an influencer engagement to be one-sided. Be prepared to field requests and respond in-kind. In fact, it’s a strong sign you’re a good fit when the relationship is mutually beneficial. Who should own the influencer program? There is a great deal of synergy between public relations and influencer efforts. PR professionals approach influencers as though they are media professionals with significant broadcast abilities. They ensure your messaging and timing are coordinated. Use their outreach and social media know-how to your advantage. Most of all, they possess the ability to connect and build relationships. There is a short amount of perishable time between launching a product or service and making the phone ring. Influencer marketing shines when the timing is right, and the message is on point. What does good influencer relations look like? Be authentic and use a personal touch to build influencer relationships. Download ‘The Power of Voice: The Art & Science of Influencer Marketing’.